2017 seems to be dominated my unicorn themed everything. Personally this makes me extremely happy as I love unicorns. People are finally discovering the beauty of a unicorn. A mythical creature associated with rainbows and glitter. When Starbucks announced that they were going to release a Unicorn Frappuccino, I was thrilled and drove to the nearest Starbucks… a little to early. 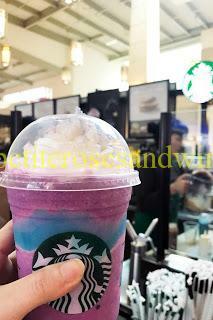 The unicorn themed frappuccino is available from April 19-23rd. After waiting a few more days, I went to Starbucks again on the release day and got my own to try. I don’t know how I feel about it. The drink is beautiful with enough sugar to kick start my early journey to diabetes heaven yet I was left disappointed. I wanted magic, rainbows, and glitter. Even though I didn’t enjoy it as much as I would have liked to, it’s worth to try at least once. My cousins went the day after I did and most of the Starbucks were already sold out of the ingredients, but they managed to hunt one down. While I was disappointed by my Unicorn Frappuccino, I was elated to find that there is a place in Fresno that sells Unicorn Macarons. Sweet Lyfe Boba Bar located by Fresno State sells them for $2.50. They pair well with the unicorn themed boba drinks and are so cute to hold. Much cuter than my attempt at making unicorn donuts a couple of months of ago. While I failed at making unicorn donuts, I managed to be successful at making unicorn noodles. Pictured below is the unicorn bowl that assembled without the miso beet sauce. Finding unicorn themed recipe and food perks up my day to day life and I can’t wait to find more. Let me know if you have any recommendations.